My first thought for this Thursday is HOW IN THE WORLD IS IT ALREADY THURSDAY? What happened to this week? It flew by. I had lunch yesterday with the newly-appointed Director of Product Programs at Pearson, the world’s largest education company. I got that verbage from their website, and the director with whom I had lunch is my son, Court. While we have lunch regularly when Bill and I are in Denver, this was our first opportunity since his promotion. I’m pretty sure he even looked different. I think he is wearing his hair in a more director-like style. I remember when I used to change his diapers. Business hasn’t exactly been booming at NanasWhimsiesShop, my shop on Etsy. My lack of sales is likely due to the fact that I stink at the marketing aspect. My sister-in-law tells me it’s all about the tags. For me, it’s all about the crocheting. While I would love to be actively selling the things I make, I seriously just love crocheting and looking at my finished results. Perhaps I am somehow exuding negative energy because I’m so annoyed that I can’t put an apostrophe in my shop’s name. 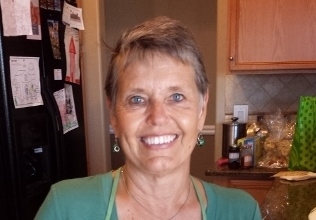 I did, however, have my second sale – or at least am about to. 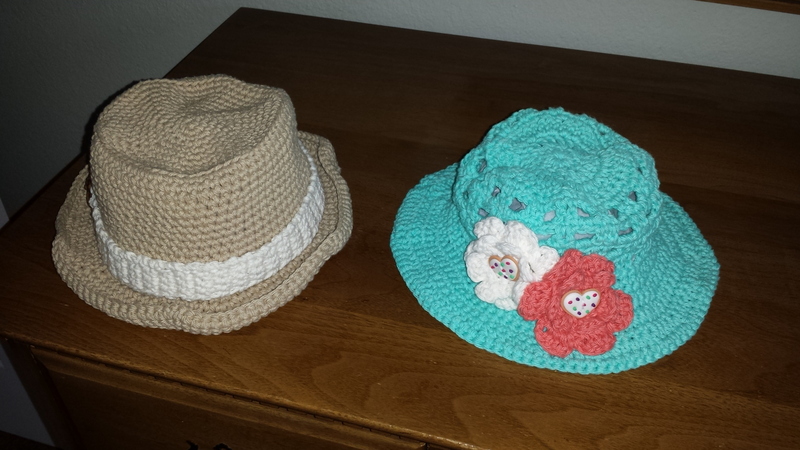 A friend ordered sun hats for her great niece and great nephew, and I am happy with the result…..
Last night we attended the Hamilton Middle School spring band concert. We are not simply gluttons for punishment with an unceasing desire to see how the youth of today spend their after-school hours. Rather, our granddaughter Adelaide plays clarinet in the band. In fact, last night, not only did she perform, but she conducted the band during one of their performances – March on a Welsh Air, and did an outstanding job. There is, of course, no blood relationship between Addie and my father; nevertheless, it makes me very happy that she plays clarinet as did he. 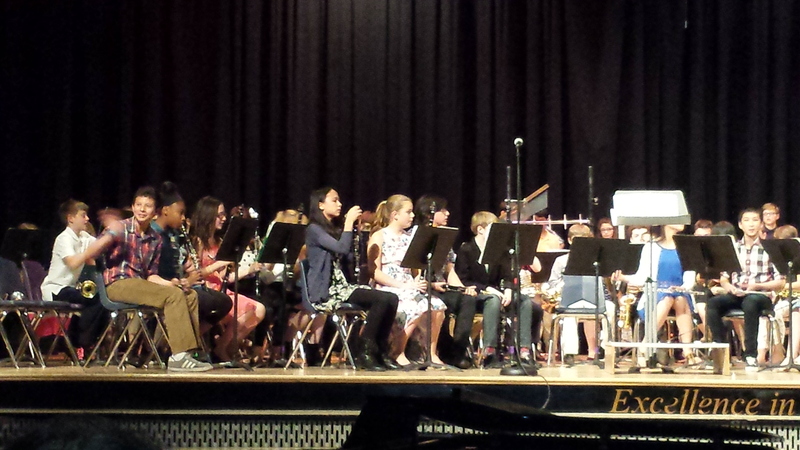 Here is a photo of the band, and one of Miss Addie conducting…. It will not surprise you to learn that once the 7th grade had concluded their performance, Bill was hard-pressed to stay awake during the 8th grade portion of the show, though he admittedly did quite a fine job. At one point, I nudged him to tell him that the next song was a Russian folk melody and so it would likely be zippy and wake him up. Ha! I forgot that Russia doesn’t do cheerful. The song was slow and somber, and reminded me that, by the end of both the movie and the book Anna Karenina, we were all begging her to jump in front of the train just to end our own misery. We have gotten used to seeing foxes in our back yard. In fact, since we have been gone so many months, there are three foxes that act like the yard belongs to them instead of us. So much so, in fact, that Bill carefully walked around the yard to see if he could find signs that their den was in our yard. Thankfully, there is no evidence. 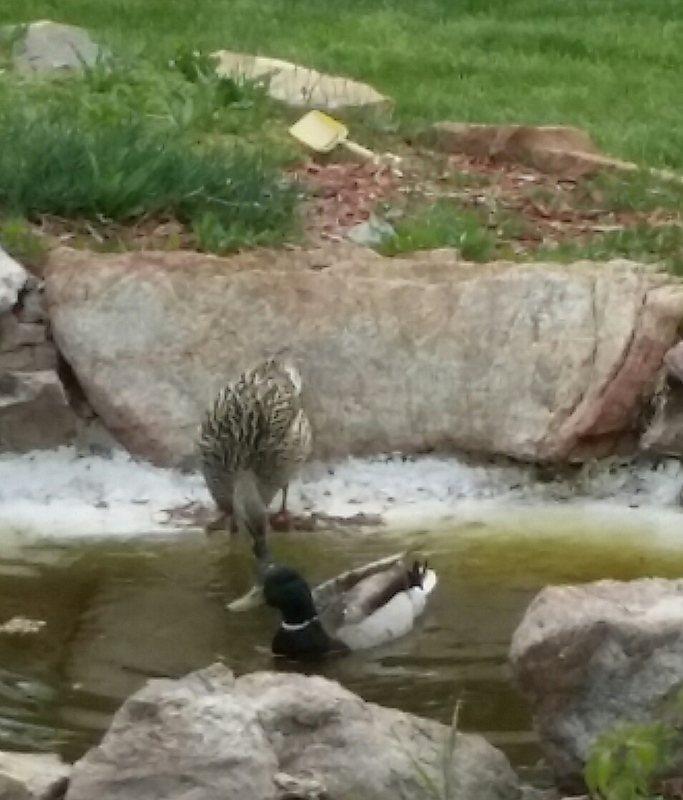 But last night as we were eating our dinner, I looked out and saw two Mallard ducks swimming in our pond. A male and a female. And let me assure you, while we do, in fact, have a small pond, it is nothing to write home about. There are much better ponds and/or lakes within an easy duck flight. We have seen raccoons, coyotes, foxes, the obvious squirrels and birds, and now our own little Wild Kingdom has been increased by two. I am sure Court appreciated the comment that you used to change is diapers! My sons hate those kind of comments…actually the older one just rolls his eyes but the younger one acts offended. Your wild life is amazing….much different than Arizona huh? My son will likely be more like your younger son. 🙂 And yes, the wild life is much different. No rattlers or scorpions, for example! I can’t believe your Wild Kingdom now includes ducks. When I think of how close you live to I-25 and DTC the animals in your neighborhood is crazy. I know! And in our little nondescript pond!